Deepika & Ranveer Were Twinning On The Chooda Ceremony But His Shoes Stole The Show! 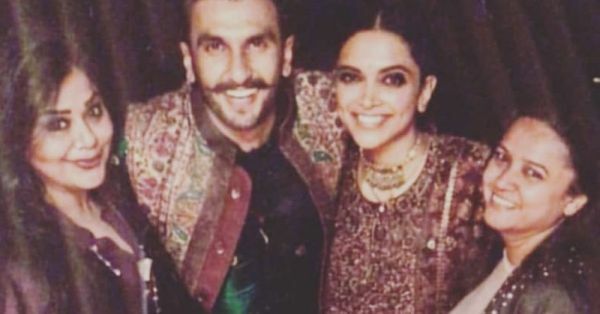 For the chooda ceremony, Deepika and Ranveer both wore coordinated Sabyasachi outfits. While DP was dressed in a churidaar suit with intricate embroidery, Baba Ranveer wore a green kurta set with a jacket that matched his bride's suit. But what we loved was his choice of footwear... A pair of white sneakers! Trust only Ranveer to carry off something like that! Although we couldn't figure out the brand, we do know that Ranveer loves his white sneakers and has been spotted wearing a pair at multiple occasions. Seems like our Punjabi Munda was not ready to part with his fave fashion accessory on his wedding too! And now that he's worn them, and so did Anand Ahuja at his reception, we'll see a lot more grooms rocking a pair with their kurtas and sherwanis!